Health Fair Connections | What's my status in the health fair? 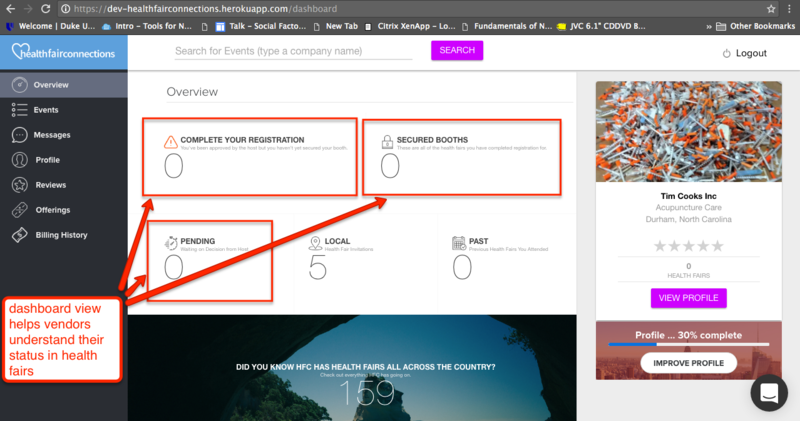 If you're ever worried you might have missed an email notification from HFC, related to the status of a particular health fair, you can quickly log in to your profile on healthfairconnections.com to see that information on your dashboard. Rule of Thumb: If you have not heard from a host (approved or denied) within seven days of the event, don't plan on attending. And this does not mean to contact the host directly. If they did not approve you, it means you were not selected. We'll send a bi-weekly event status email that keeps you informed of where you stand in health fairs. There are four types of updates you could see associated with health fairs. This update means the host company has approved you to attend their health fair, but you need to complete the last step of registration to officially be confirmed as a vendor. This update means the host has not made a decision on if they would like you to attend yet. And remember, if you have not heard from the host within 7 - 10 days of the health fair, plan on not attending. Unfortunately, this means the host reviewed your listing and decided that would not like you to attend their event this year. All host are different and have different ideas of what they want out of their health fair. You completed both steps of registration, and you're officially secured on the vendor registration list. We hope this post helps provide some clarification! !